In 1772, the Roggeveen Dutchman, towards Polynesia, unloads on an island. It is the Easter Day : it calls it Easter Island. Its curiosity is then waked up by 600 gigantic statues, going up to 20 meters, turned towards the sun. Contrary to this much believe, they don't represent only whole heads, but bodies. However, the heads are so disproportionate compared to the body which one only sees they. The career, near to the volcano, contains more than 200 additional statues, not completed. 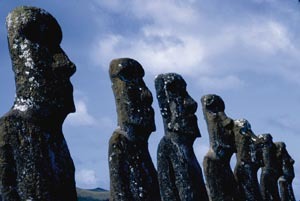 Called « moai », these statues were set up between 500 and 800 of our era. Today annexed by Chile, the island was formerly inhabited by ten different tribes. One does not know the origin of the population pascuane of the time, if not which it is related to the Polynesians. In 1862, the island undergoes a raid of slaves, and the population is almost entirely removed. It remains today only little of pascuans of origin.